Department of Pharmacology and Therapeutics, College of Medicine, Qassim University, Qassim, KSA. melatonin to these organs was also assessed. treatment groups was kept at 6 hours after the last dosage. malin and used in histological studies after processing. used as an external standard. were measured as described by Sedlak and Lindsay . cold 0.02 M ethylenediaminetetraacetic acid disodium. total nitrate and nitrite the stable main metabolite of NO. enediamine (NEDD) premixed just prior to the assay. Corporation, Japan) after 30 - 45 min incubation at 37˚C. statistical inference. Data are expressed as mean ± SEM. levels of lipid peroxides significantly at 5 mg/kg dose. significantly (P < 0.001) in all the three tissues analyzed. in GSH contents that were significantly reduced by Dox. tissue at both of the doses of melatonin (Table 2). control. *P < 0.05; **P < 0.01 and ***P < 0.001. #P < 0.001 and $P < 0.01 compared to doxorubicin alone; @P < 0.001 Group 6 compared to Group 4.
control. *P < 0.05; **P < 0.01 and ***P < 0.001. #P < 0.001, $P < 0.01 and ∆P < 0.05 compared to doxorubicin alone; @P < 0.001 Group 6 compared to Group 4.
group in any of the tissues analyzed (Table 3). mal except few hepatocytes typify atrophied. control. *P < 0.05; **P < 0.01 and ***P < 0.001. 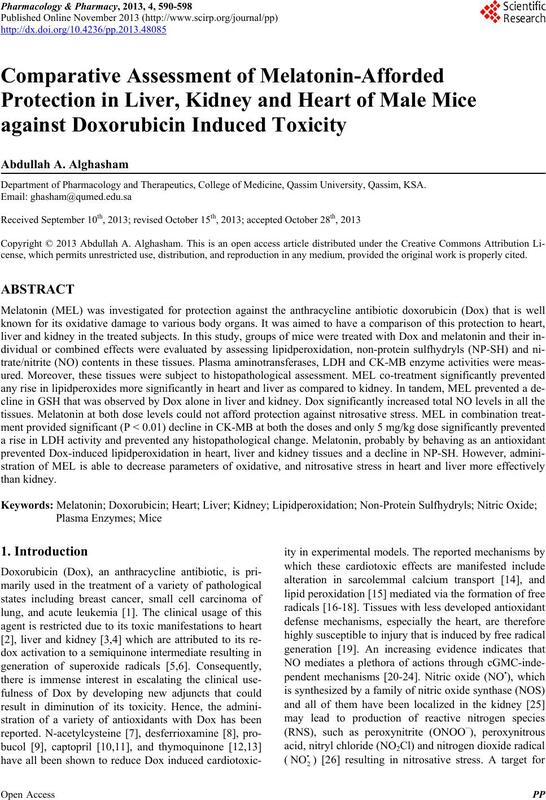 #P < 0.001, $P < 0.01 and ∆P < 0.05 compared to doxorubicin alone; @P < 0.05 Group 6 compared to Group 4. Table 4. 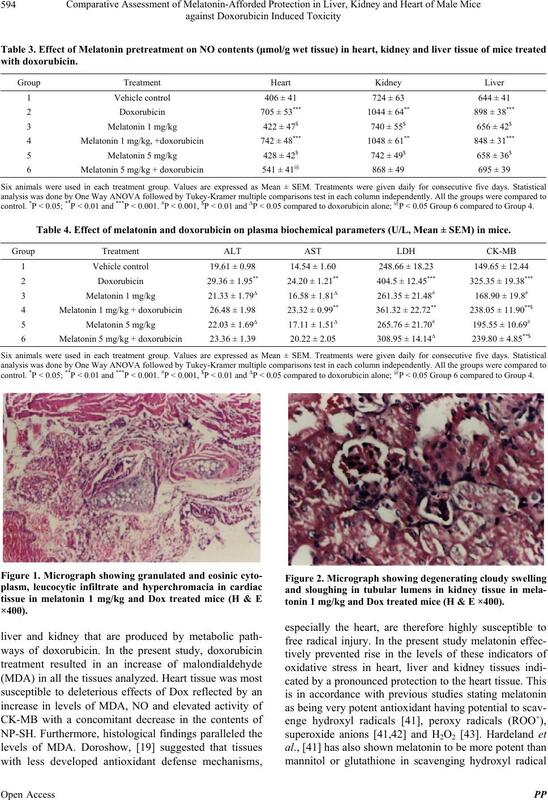 Effect of melatonin and doxorubicin on plasma biochemical parameters (U/L, Mean ± SEM) in mice. 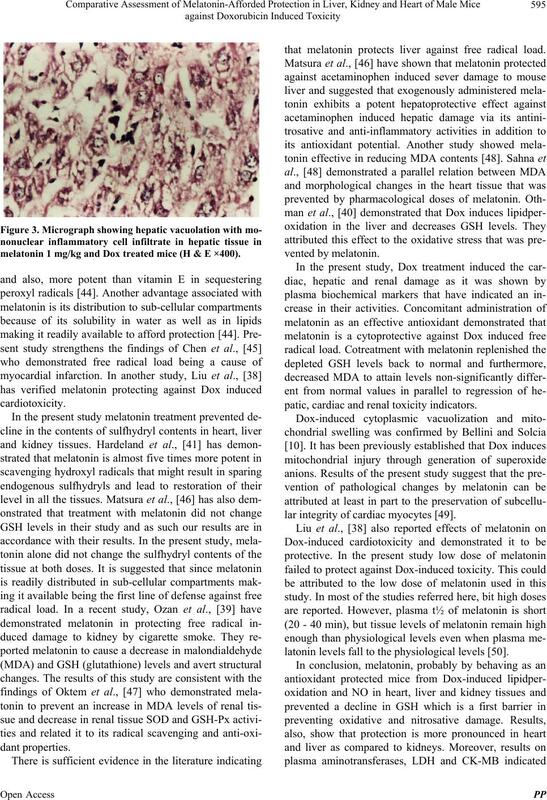 tonin 1 mg/kg and Dox treated mice (H & E ×400). 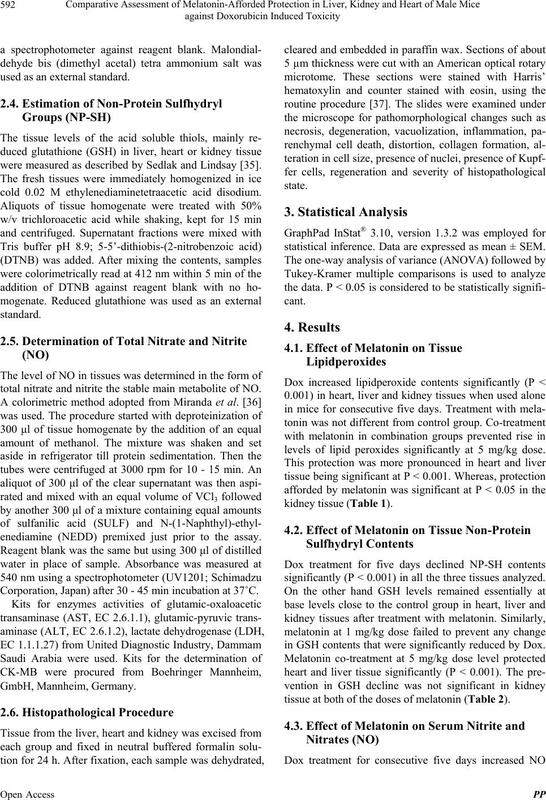 melatonin 1 mg/kg and Dox treated mice (H & E ×400). 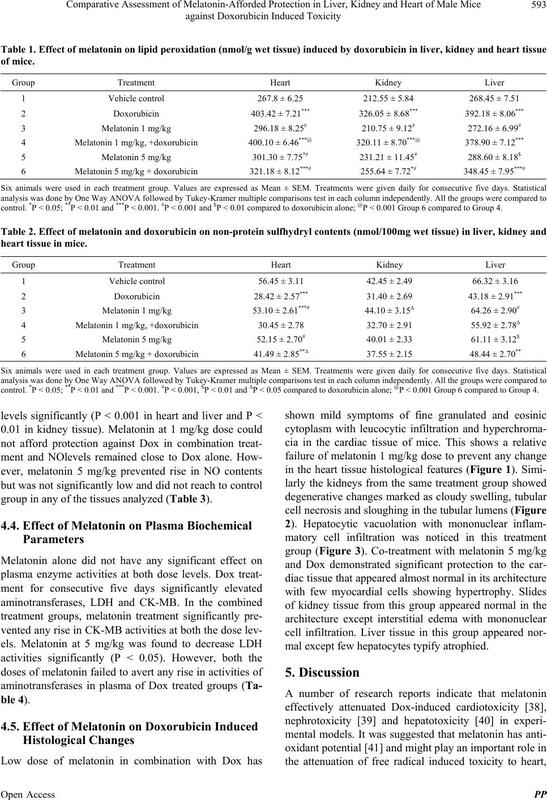 that melatonin protects liver against free radical load. patic, cardiac and renal toxicity indicators. lar integrity of cardiac myocytes . latonin levels fall to the physiological levels . Internal Medicine, Vol. 80, No. 2, 1974, pp. 249-259. Vol. 19, No. 8, 1987, pp. 817-828. M. P. O’Donnel, L. Pichels, B. L. Kasiske, L. Raij and W.
and Clinical Medicine, Vol. 106, No. 1, 1985, pp. 62-67. 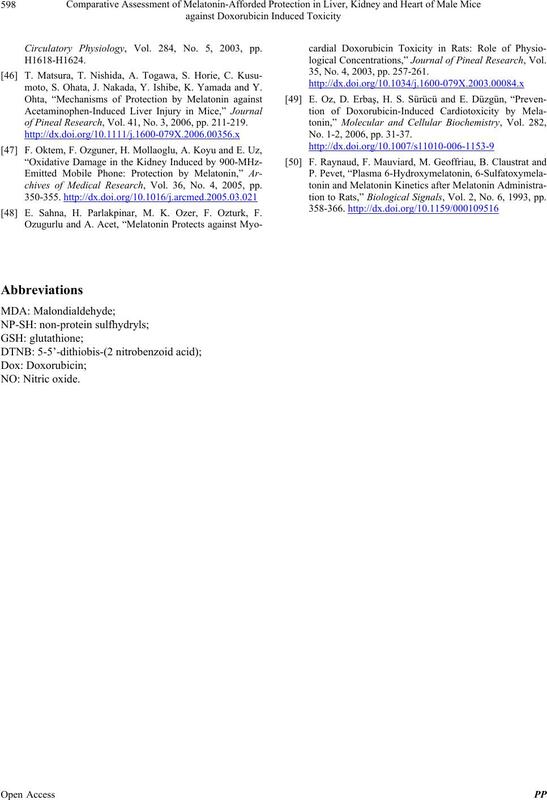 T. Zima, V. Tesar, J. Crkovská, A. Stejskalová, J.
Pláteník, J. Temínová, K. Nemecek, M. Janebová and S.
Nitrogen Species,” Journal of Biological Chemistry, Vol. 275, No. 43, 2000, pp. 33585-33592. 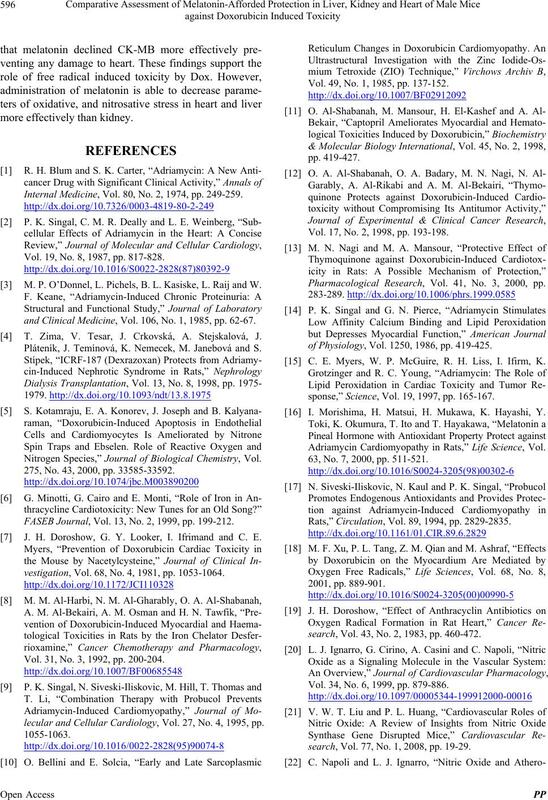 FASEB Journal, Vol. 13, No. 2, 1999, pp. 199-212. J. H. Doroshow, G. Y. Looker, I. Ifrimand and C. E.
vestigation, Vol. 68, No. 4, 1981, pp. 1053-1064. Vol. 31, No. 3, 1992, pp. 200-204.
lecular and Cellular Cardiology, Vol. 27, No. 4, 1995, pp. Vol. 49, No. 1, 1985, pp. 137-152. Vol. 17, No. 2, 1998, pp. 193-198. Pharmacological Research, Vol. 41, No. 3, 2000, pp. of Physiology, Vol. 1250, 1986, pp. 419-425. C. E. Myers, W. P. McGuire, R. H. Liss, I. Ifirm, K.
sponse,” Science, Vol. 19, 1997, pp. 165-167. 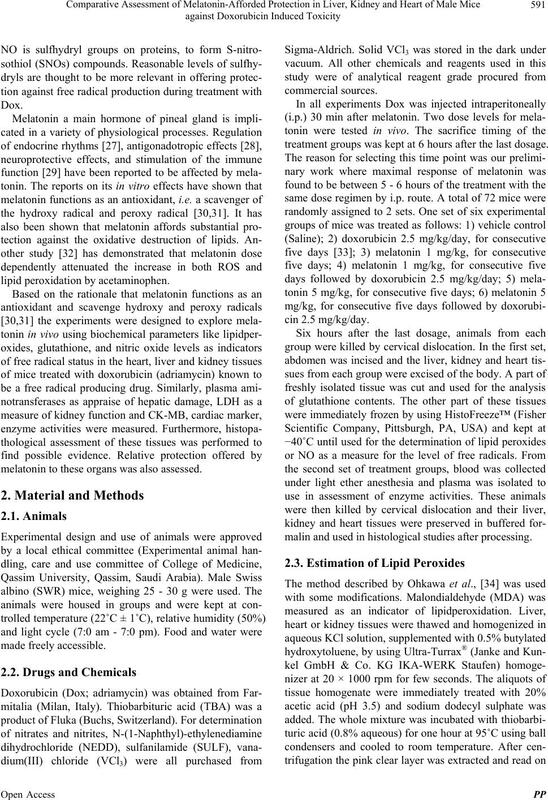 I. Morishima, H. Matsui, H. Mukawa, K. Hayashi, Y.
Adriamycin Cardiomyopathy in Rats,” Life Science, Vol. 63, No. 7, 2000, pp. 511-521. Rats,” Circulation, Vol. 89, 1994, pp. 2829-2835.
search, Vol. 43, No. 2, 1983, pp. 460-472. Vol. 34, No. 6, 1999, pp. 879-886.
search, Vol. 77, No. 1, 2008, pp. 19-29.
sclerosis,” Nitric Oxide, Vol. 5, No. 2, 2001, pp. 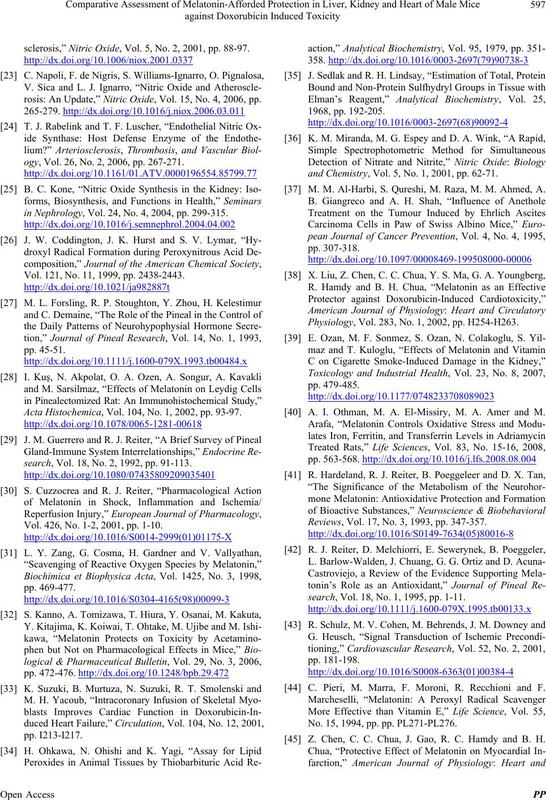 88-97.
rosis: An Update,” Nitric Oxide, Vol. 15, No. 4, 2006, pp. ogy, Vol. 26, No. 2, 2006, pp. 267-271.
in Nephrology, Vol. 24, No. 4, 2004, pp. 299-315. Vol. 121, No. 11, 1999, pp. 2438-2443. Acta Histochemica, Vol. 104, No. 1, 2002, pp. 93-97.
search, Vol. 18, No. 2, 1992, pp. 91-113. Vol. 426, No. 1-2, 2001, pp. 1-10.
and Chemistry, Vol. 5, No. 1, 2001, pp. 62-71. M. M. Al-Harbi, S. Qureshi, M. Raza, M. M. Ahmed, A.
Physiology, Vol. 283, No. 1, 2002, pp. H254-H263. A. I. Othman, M. A. El-Missiry, M. A. Amer and M.
Reviews, Vol. 17, No. 3, 1993, pp. 347-357.
search, Vol. 18, No. 1, 1995, pp. 1-11. C. Pieri, M. Marra, F. Moroni, R. Recchioni and F.
No. 15, 1994, pp. pp. PL271-PL276. Z. Chen, C. C. Chua, J. Gao, R. C. Hamdy and B. H.
Circulatory Physiology, Vol. 284, No. 5, 2003, pp. moto, S. Ohata, J. Nakada, Y. Ishibe, K. Yamada and Y.
of Pineal Research, Vol. 41, No. 3, 2006, pp. 211-219.
chives of Medical Research, Vol. 36, No. 4, 2005, pp. E. Sahna, H. Parlakpinar, M. K. Ozer, F. Ozturk, F.
logical Concentrations,” Journal of Pineal Research, Vol. 35, No. 4, 2003, pp. 257-261. No. 1-2, 2006, pp. 31-37.
tion to Rats,” Biological Signals, Vol. 2, No. 6, 1993, pp.